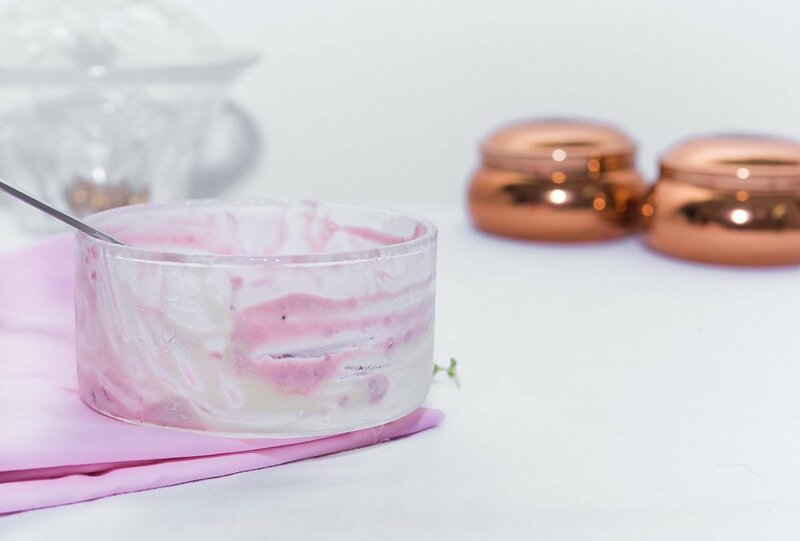 Luscious, lightest, smoothest ice cream ever, and the name is Semifreddo. This is an Italian ice-cream. Unlike other ice creams, Semifreddo is not severed frozen. The word Freddo means frozen, and this is a semi-frozen Ice-cream. The texture is somewhere between mousse and ice cream. The creamy, soft, pillowy, chilled feel in the mouth makes this a special ice-cream. The best part – You will not need an Ice-cream machine to make this at home. It is quick to prepare, and you require very few ingredients. The actual, authentic recipe of Semifreddo is with eggs. I have tried both the versions in my kitchen. Honestly, if you are not an Italian food-pro, you will not be able to make out any difference, between my eggless version of Semifreddo and the original Semifreddo. Both are quick and easy to prepare and are absolutely moreish, that you will end up making them over and over again. The authentic Semifreddo is made in a loaf pan, like a frozen brick and is served sliced into segments. When making Semifreddo at home, I decided to give it my own style. And made it into these Borosil freezer-proof glass bowls. I made these on Valentines Day for Pranav. Actually, we had a small disagreement in the morning, before he left for the office. I was left feeling silly to bring up a senseless discussion on Valentine’s day. These were my apology & patch-up Ice cream cups for him. After that, we went for a good dinner date in the night. And things are back to normal now. 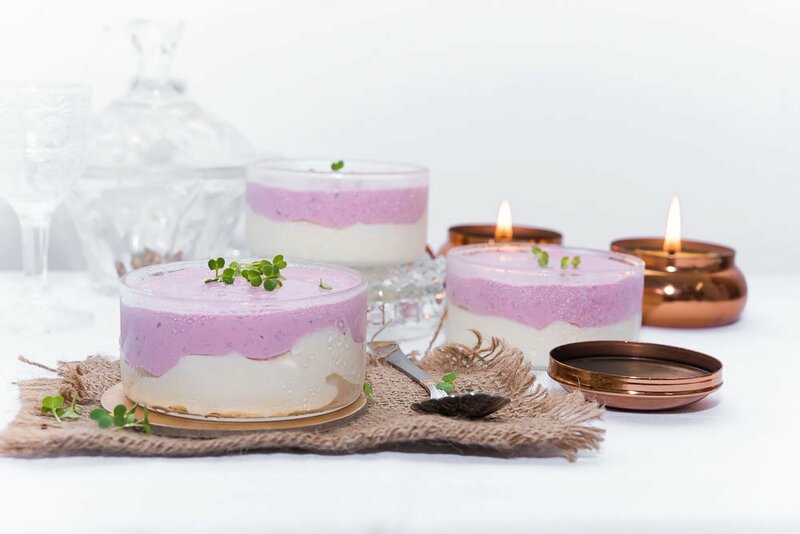 When making eggless semifreddo, my goal was to accomplish the same authentic texture and an excellent flavour. 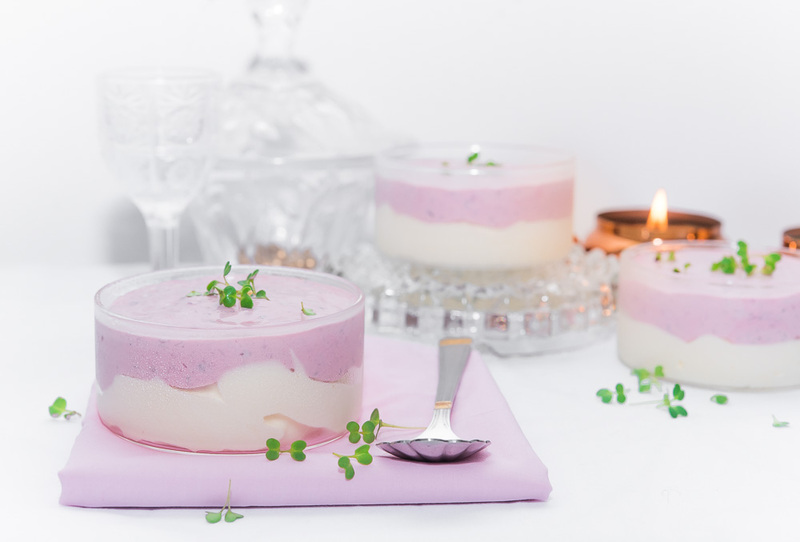 I went through several ideas and experiments to accomplish the luscious, creamy, soft semifreddo. First, we make zabaglione (Italian frothy custard). This is made using egg yolks and sugar over the double boiler and whisked until pale and thick in texture. Once the custard base is made, flavouring is added and it is folded together with the whipped cream. Important is to mix the ingredients completely without deflating the whipped cream. Some recipes do have an addition of fluffy, glossy Swiss Meringue. But in my eggless version, I have used custard powder to make my Zabaglione. And also added blueberry preserves. I am gonna share few do’s and don’ts with you below, so it gets easy for you to understand and make semifreddo at home. Basic custard – you can either use vanilla custard powder (easily available) or cornstarch powder (add vanilla extract as flavouring) The measuring quantity will not differ in this recipe. Remember – It is important to have thick consistency of the custard. Which is without lumps, and is very smooth, similar to the image shown here. When the custard cools down a little, you will need to incorporate air to the custard using an electric whisk Bajaj HM 01 250-Watt Hand Blender (Black) . 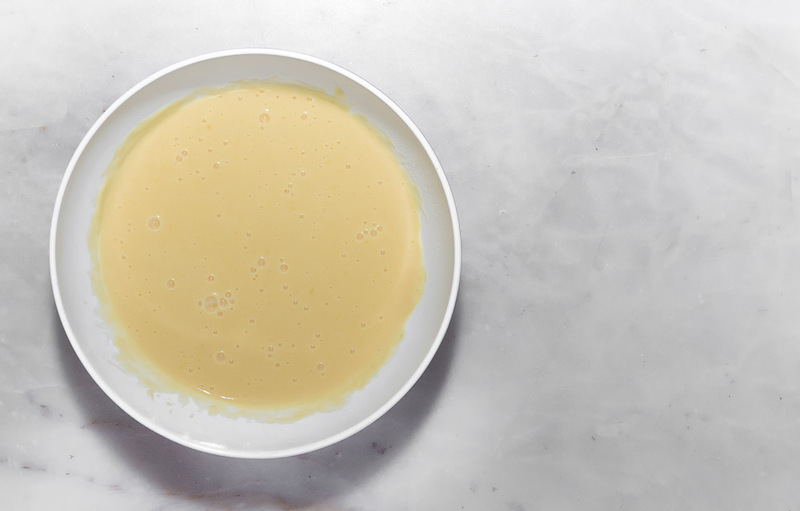 When making the custard, make sure to whisk continuously during cooking time, to prevent the formation of lumps in the custard. Keep the flame on medium-low. 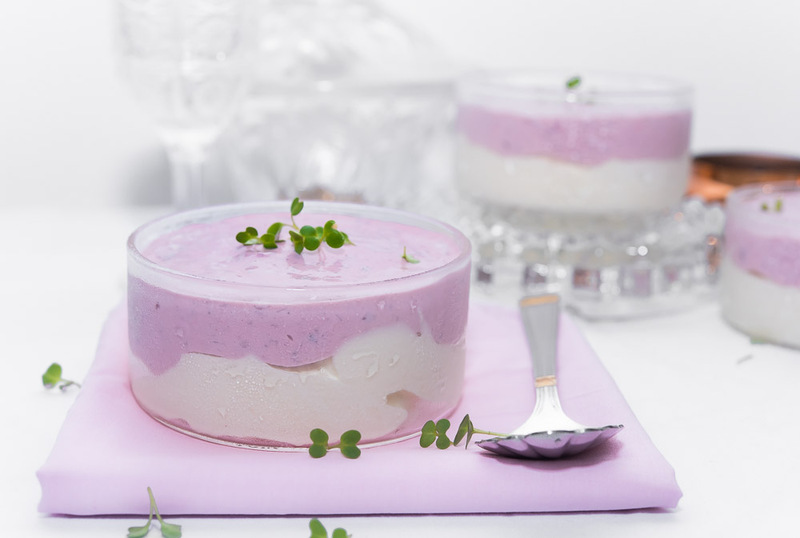 I have used English Black Currant flavour from Ossoro to enhance the flavours. Ossoro English Blackcurrant, 30 ml Its so brilliant, that without much effort, the ice cream turned out absolutely blackcurranty in flavour. Other then Ossoro flavour, I have also used blackcurrant preserves. St Dalfour Fruit Preserve, BlackCurrant, 284grams Divided the prepared mix into two portions and added preserve to one half. Another important part – I have used non-dairy whipping cream from Tropilite. It whips up very quickly, without much effort. It is very important to whip the cream, till you get stiff peaks. Amul will not work for this recipe. You can also use heavy full-fat whipping cream. It is easily available in any good dairy. 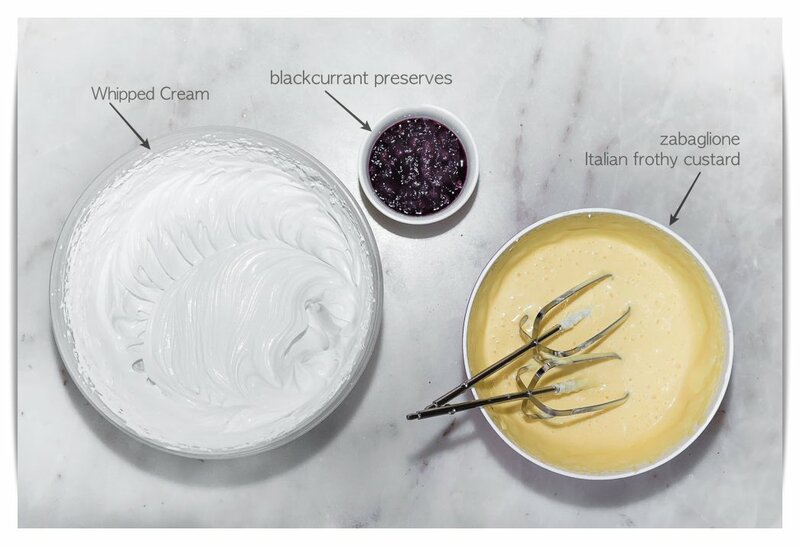 Make sure to chill the cream and the container along with whisk, before you begin to whisk the cream. Make the custard – Heat the milk in a sauce pan. Take out two tablespoons of milk out in a bowl. Add custard powder to it and mix well. Add custard mix to the hot milk, kept on the low flame and whisk. Cook until it starts to thicken whisking continuously, to prevent the formation of lumps. Add sugar and cook for another 3 minutes. Add butter and turn off the flame. Let it cool to the room temperature. Keep whisking at regular intervals to prevent the formation of a skin on the top layer of the custard. 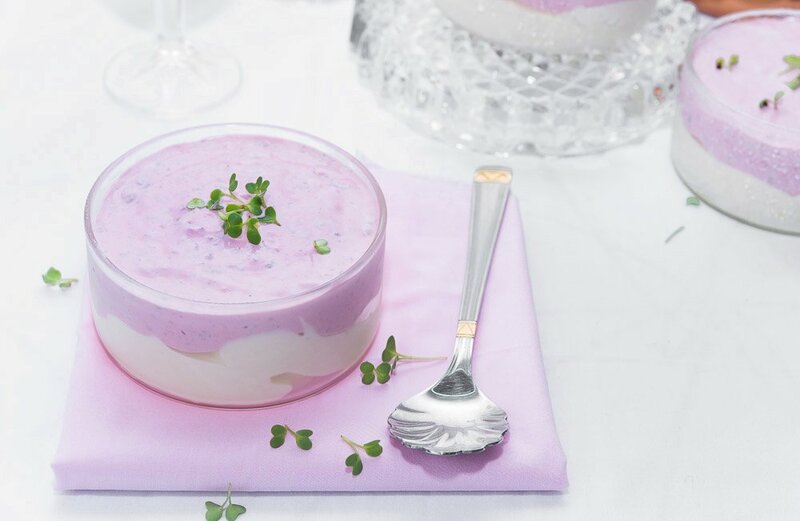 Add in black currant flavour and use an electric whisk to incorporate air in the custard. This might take around 8-10 minutes of speed whisking. The custard will not thicken or increase in volume, but will have many air bubbles and will get lighter in texture. Pour it into a big bowl and add whipped cream. 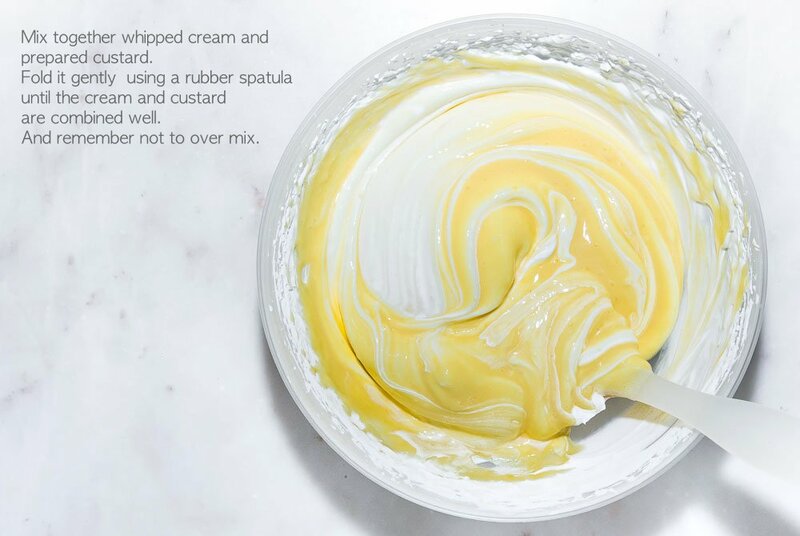 Fold them both gently as if you are folding cake batter using a rubber spatula until the cream and custard are combined well. 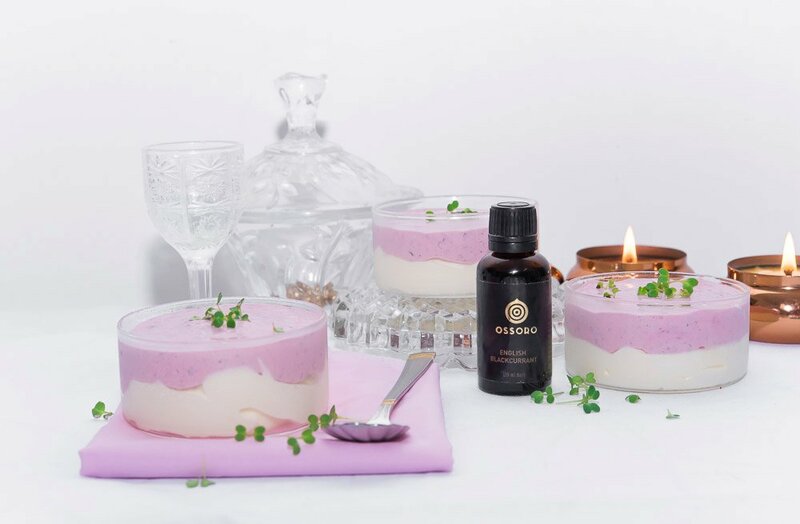 Add a few drops of Ossoro English Black Currant flavour and mix well. 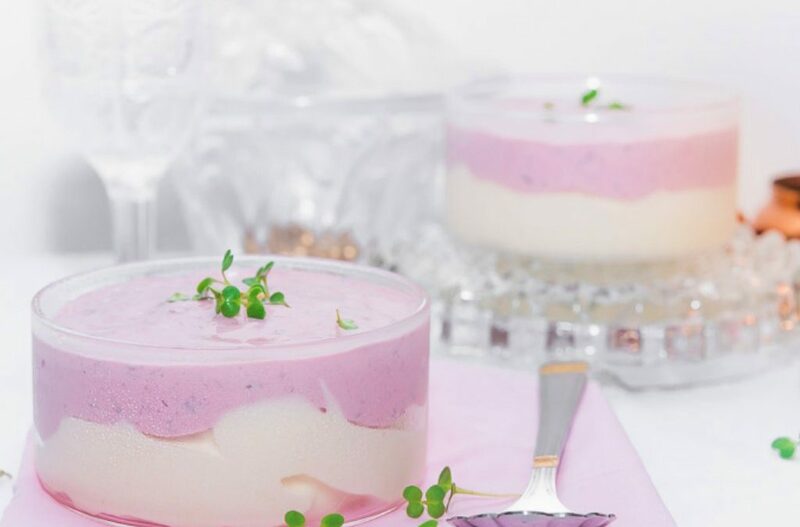 Divide the prepared Semifreddo into two portions and add black currant preserve to one half of it. Pour in the serving glasses or bowls forming two different layers. Cover the top with cling film and freeze overnight. Enjoy the yum ice-cream with your family.